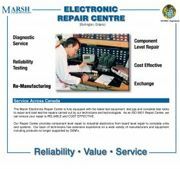 MARSH can repair all of the major brands of AC and DC Motor drives, programmable controllers, counters, timers, temperature controllers, instrumentation, process controls, encoders, PLC’s, electronic boards, power supplies, plus much more. All repair prices are based on standards and procedures associated with electronic repair classifications. As an added service to our Customers, when we are not presently servicing an item ourselves, our Outsourcing Department will process your item through a qualified outsource vender at competitive pricing. Please call Customer Service if you have any questions concerning the service of an item.